Atomic Burger opens next week in Baton Rouge. It seems as though every week brings a new business or restaurant to the Arlington Marketplace area near LSU. “Coming soon” signs crowd the newly built shopping center, promising good eats and good times in our futures. One of the restaurants we are most looking forward to? Atomic Burger. Construction for the second location of the New Orleans burger joint has been slowly beginning to resemble the original’s vibrant and contemporary burger shop design. 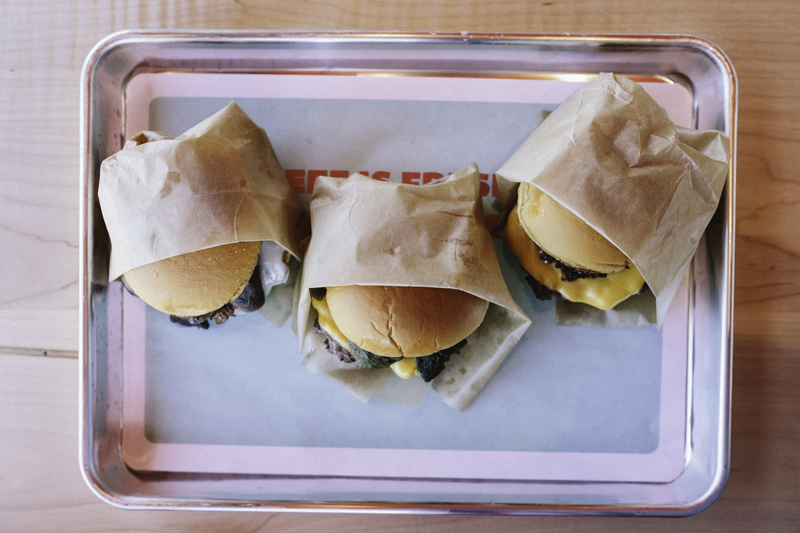 On the brink of its grand opening, we got a chance to sneak in and check it out—and of course try its praise-worthy burgers and shakes. The new restaurant is bathed in great lighting and a bright red interior color scheme—promising some Insta-worthy backgrounds to snap a few pictures of its food. 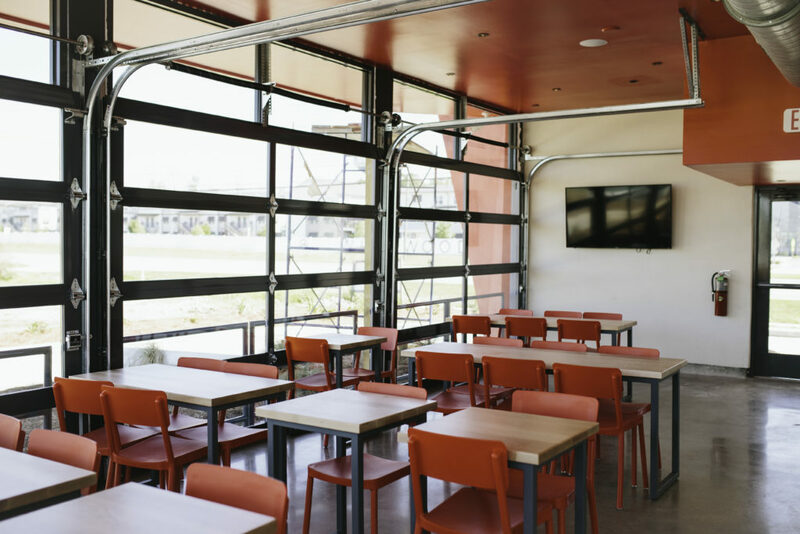 For a seemingly small restaurant, there is plenty of seating available to eat and hangout. But as co-owner Joe Spitale explains, what makes Atomic Burger unique is just as much about what’s on the outside: It features a drive-thru window for those in a hurry. 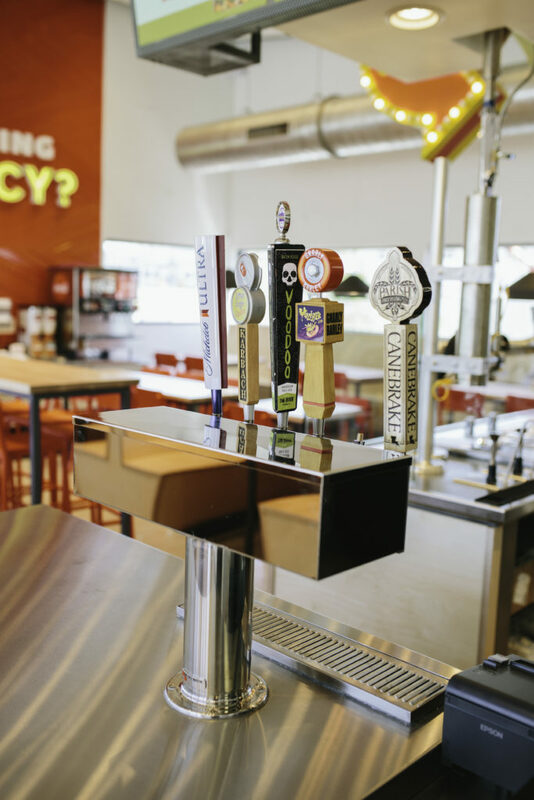 Brothers Joe and Nick Spitale, who attended LSU in their college years, knew Baton Rouge would appreciate Atomic Burger’s attention to good ingredients as well as quick preparation, which is why they set their sights on the Red Stick for their second location. The menu centers on four main styles of burgers: the Atomic Burger made with original toppings and its signature A.B. Sauce; the Green Chile Burger dressed with roasted poblano peppers; the Mushroom Swiss Burger topped with onions, mushrooms, mayo and Swiss cheese; and the Jamburger, featuring its popular bacon-onion jam. The burgers can also be served as sliders, meaning you can try every Atomic Burger combination without feeling too guilty. While I predicted Atomic Burger would make a mean burger, I was still thoroughly impressed by how good they actually were. The meat was seasoned well, and each flavor combination provided perfect contrasts. The real winner for me was the classic Atomic Burger because of the A.B. Sauce, which added a tangy smack to the patty’s bold taste. The Jamburger was a close second—I could definitely eat the bacon-onion jam any time of day. In the midst of my burger marathon, I wandered over to the sauce bar for something to dip my fries in. Expecting classic condiments, I was surprised to find a flurry of options like Sriracha mayo, roasted garlic aioli and truffle mayo. I opted for the spicy ketchup, which offered the flavor of real peppers—something I did not expect but welcomed after my first try. With the high-quality ingredients and ingenious flavor combinations, I wondered how Atomic Burger could offer food so good yet so quickly through a drive-thru. Joe explains that it took trial and error—as well as a little creativity. One of the best examples of this, he says, is the eatery’s Atomic Shakes. The chilly desserts combine a custard base that’s made daily with liquid nitrogen and fresh mix-ins. The high-tech process ensures the freshest shakes as well as a quick journey from the kitchen to your mouth. 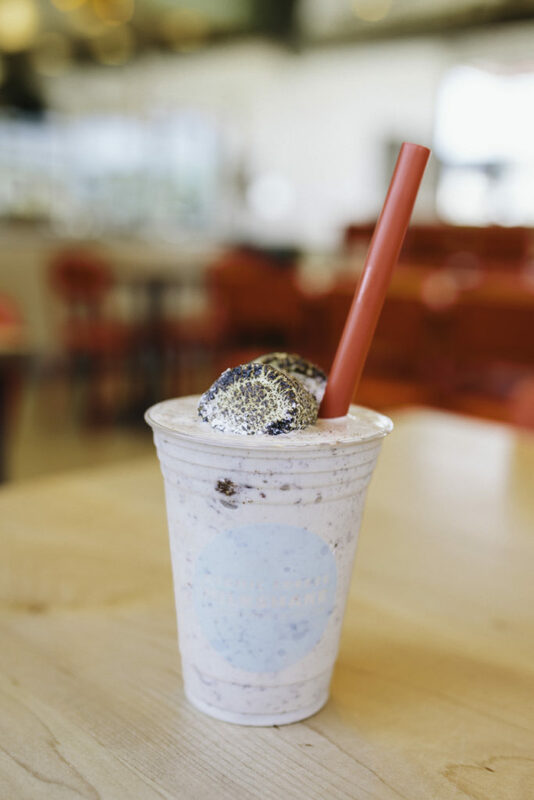 The milkshakes come in classic flavors like vanilla, chocolate and strawberry, as well as artisan flavors that change daily. 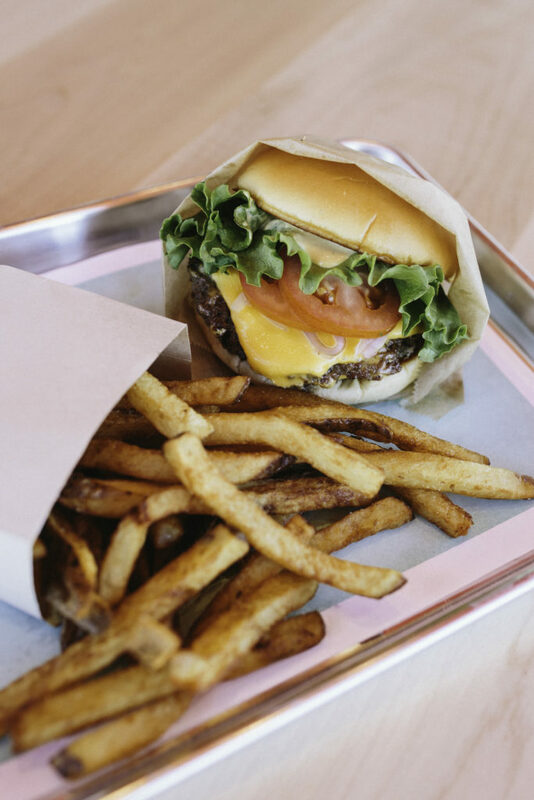 Atomic Burger is welcomed new addition to the local food scene. The only downside? Food this good and a convenient drive-thru window have me and my waistband a little scared. 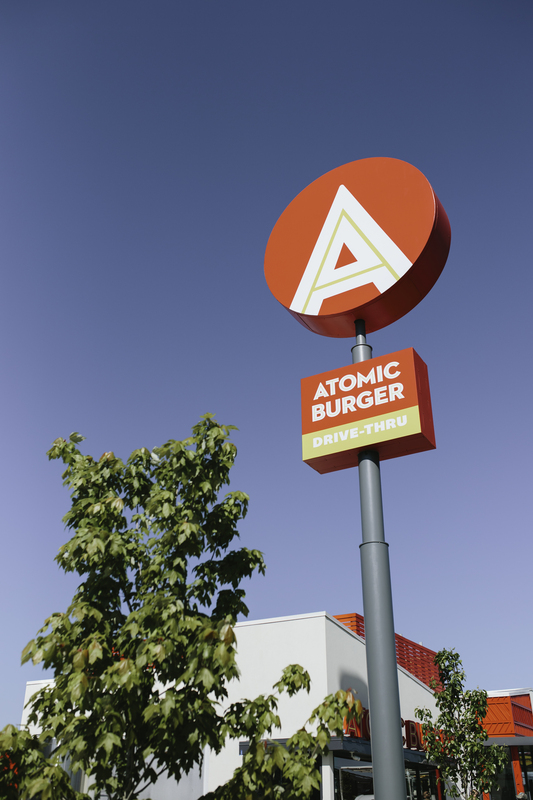 Atomic Burger is at 5909 Creek Centre Drive. The restaurant is expected to open to the public early next week and will operate seven days a week, 11 a.m.-10 p.m.